Hitting the road in a new and previously unexplored country can be an exciting, but occasionally daunting, experience. With a need to get to grips with new laws, rules and cultural best practices quickly, you can be left scratching your head and with a fear of incurring potentially hefty fines. Not to mention the risk of infuriating the locals. But driving in a new country shouldn’t be scary. It is an opportunity to experience something new and learn in the process. You just need a little crucial information to get you started. As you most probably know, Europe is a lot smaller than the US or Canada, therefore driving distances are not that terrifying. 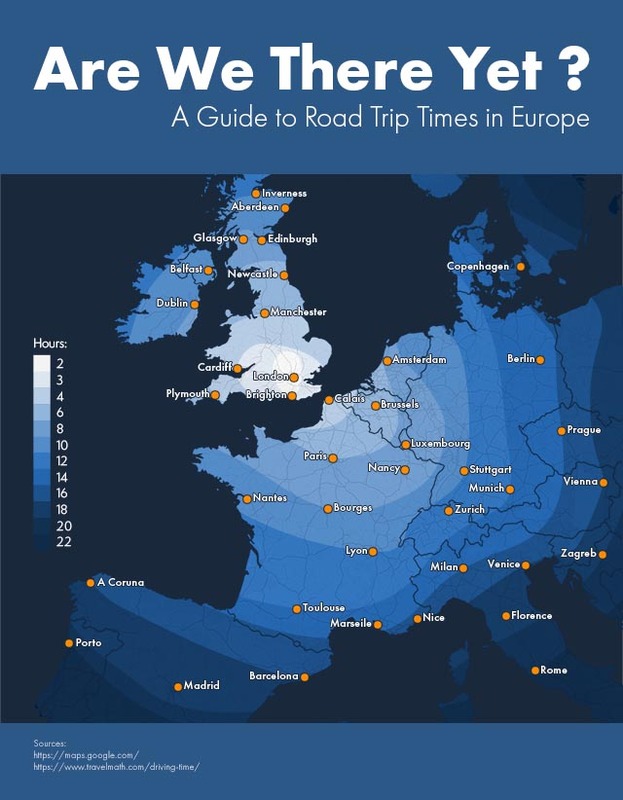 For example getting from London to Amsterdam or Paris takes only around 6-7 hours, whereas driving from New York to Los Angeles would take around 40 hours. The first and most important question to ask when driving in Europe is whether you are legally qualified to be on the road. Depending on where you are travelling from, you may be required to apply for an International Driver Permit (IDP) when travelling in Europe. However, many countries in Europe do not require an IDP or only require one in special circumstances. So it is worth checking the laws of the specific country you are visiting. Regardless of whether your driving licence is valid, you will also need to make sure that you meet the laws on age requirements. For example, many states in the USA will allow you to drive at 16, whereas most European countries will not allow you on the road until you are 17 or 18. When driving in Europe you will want to save your money for all the incredible attractions. So avoiding hefty speeding fines is a must. 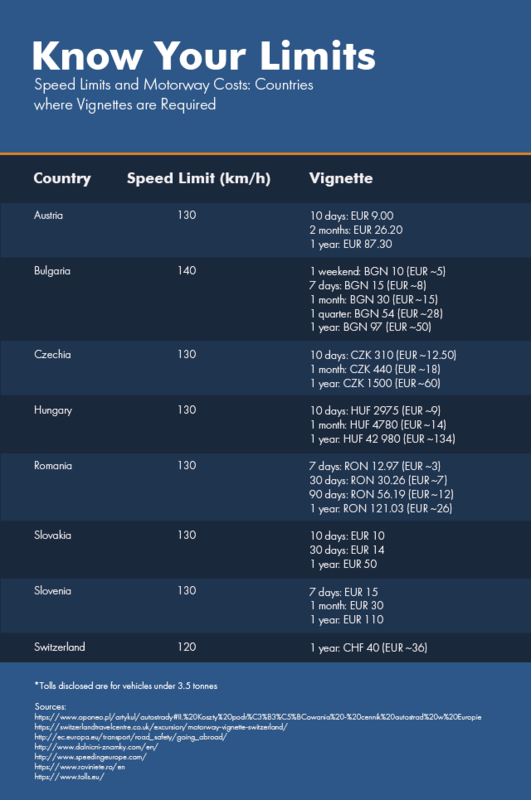 Motorway speed limits across Europe vary quite vastly. 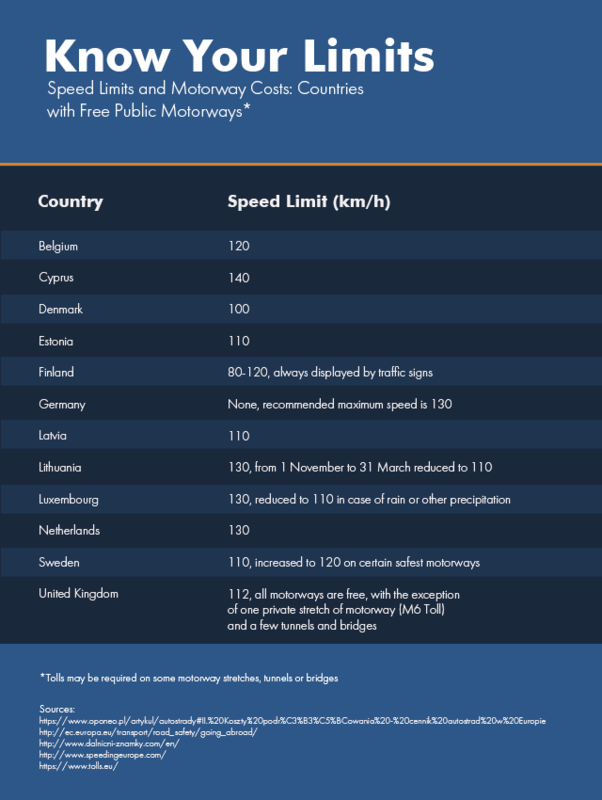 With countries such as Denmark sitting at the low end with a speed limit of 100 km/h and countries such as Bulgaria and Cyprus allowing speeds of up to 140 km/h. Always look at road signs! • Winter tyres/snow chain (season/terrain dependent). Although this kit seems simple, it is easy to overlook. Forgetting to pack essential kit can lead to fines of up to €1,500 (in Belgium). They love a good tax in Europe. Not content with a simple road tax, many countries also charge a vignette which is a road tax usually based on the time a vehicle spends on the road. In Europe, different countries apply this to different vehicles and to different levels. It is worth checking if/what vignette applies in the country you plan on driving in before arriving. One helpful tip that is worth considering before you set off is ensuring you have some spare change in order to pay any tolls you come across. Although some countries in Europe have very few toll roads (in the UK for example), failing to have some change handy to pay for them when required can leave you in an unfortunate situation. Luckily, a lot of toll stations allow payment by card nowadays. Europe is a small continent, but with the large amount of different countries it has, laws will inevitably change every few hours when you cross yet another border. 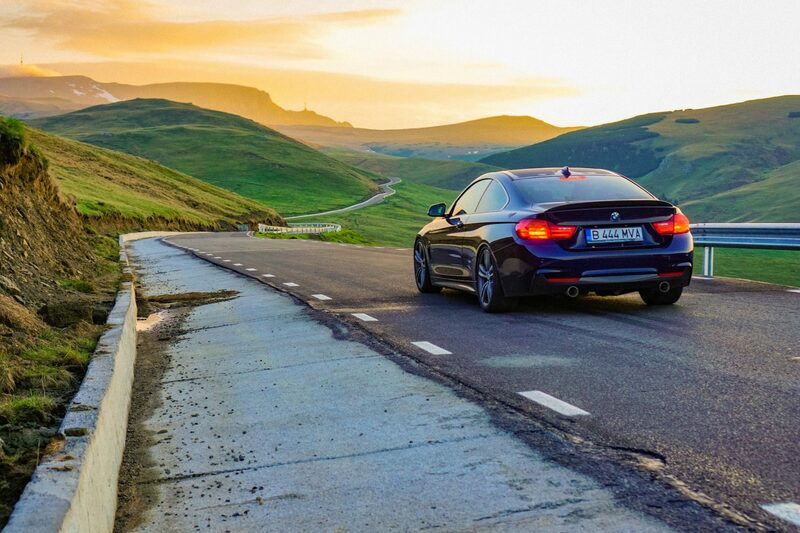 Some countries such as Denmark and Germany have free roads, so when you plan your journey, remember to check which ones can save you quite a lot of money. Driving in Europe should be a fun and exciting experience. The tips highlighted in this article will help you get to grips with some of the rules and cultural norms you may find when hitting the road.